You've likely seen photos like this one, depicting a powerful, towering waterfall splashing down into a series of aquamarine pools. But until you've experienced it in person, stood behind the thundering 100-foot chute of water and swum in the bracing 70° travertine pools, the picture can't tell the whole story. 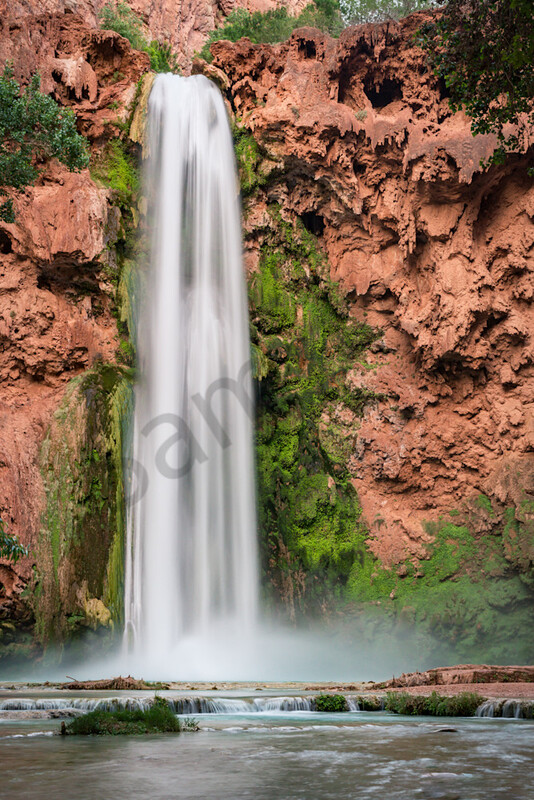 According to Grand Canyons website, Havasu Canyon, home to the Havasupai Indians, is a paradise located in western Grand Canyon known worldwide for its series of waterfalls and beautifully sculpted rock. In this idyllic setting of lush side canyons and sun-splashed cliffs a small group of indigenous hunters and farmers arrived centuries ago and carved out a simple lifestyle; one that continues to this day. Havasu Creek, the carver of this serpentine side canyon below the South Rim, is fed by a deep aquifer. The perennial desert stream tumbles over Upper and Lower Navajo Falls, then Havasu Falls, Mooney Falls and finally Beaver Falls on its journey to the Colorado River on the floor of the Grand Canyon. The presence of calcium carbonate in the highly mineralized, spring-fed water gives Havasu Creek its distinctive blue-green color. This same robust creek sustains a rich riparian ecosystem that is home to a wide variety of plants, birds, and animals. Though many Supai tribal members continue to farm in this flood-prone drainage, tourism has emerged as the tribe's primary source of income. Fee-based camping is offered year round. In addition to backpackers, visitors arrive by helicopter and horseback, some staying in the tribe's rustic lodge. Camping in Havasu Canyon requires a permit and reservations that can be obtained directly from the tribe. DO NOT just show up, or you'll risk hiking 10 miles only to find you don't have a campsite, and if there does happen to be an available site, you'll be billed at twice the usual rate.